SANTA CLARA, CA--(Marketwired - Apr 14, 2015) - Cypress Semiconductor Corp. (NASDAQ: CY) will be showcasing its latest PSoC®-based Bluetooth® Smart solutions in booth number 01 at the Bluetooth World 2015 conference, being held April 14-15 at the Santa Clara Convention Center. Bluetooth World is the world's only global conference focusing on Bluetooth in the IoT arena. The event will feature 700 conference attendees, 40 exhibitors and more than 90 conference speakers including Jayant Somani, senior director for Cypress's Bluetooth Smart solutions, who will deliver a presentation titled "Battery-less Bluetooth Made Easy" on Wednesday, April 15 at 1:30 p.m. Somani will also participate in a panel discussion titled "Tangled in Wireless Connections -- Bluetooth's Role in a Crowded Connectivity Space," which will be held at 2:15 p.m.
Cypress's Bluetooth Smart offerings include PSoC 4 BLE -- the industry's most versatile single-chip solution for IoT applications, home automation, healthcare equipment, sports and fitness monitors, and other wearable smart devices; PRoC™ BLE, a cost-effective programmable radio-on-chip solution for wireless Human Interface Devices (HIDs), remote controls and other applications. Cypress will also demonstrate its new EZ-BLE™ PRoC module, which provides a complete Bluetooth Smart solution in a 10-mm x 10-mm x 1.8-mm form factor with Bluetooth 4.1 qualification and worldwide regulatory certification, greatly simplifying design and cutting time to market. The offerings are supported by the PSoC 4 BLE Pioneer Kit, an easy-to-use development board priced at under $50. 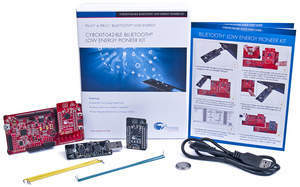 The PSoC 4 BLE Pioneer Kit was recently the focal point of an IoT design contest co-sponsored by Cypress and Arrow Electronics. Contest finalist entries can be viewed and voted on at the Make magazine website at http://makezine.com/psoc-maker-challenge/. Cypress's PSoC 4 BLE solution integrates a Bluetooth Smart radio, a high-performance 32-bit ARM® Cortex®-M0 core with ultra-low-power modes, programmable analog blocks, and Cypress's industry-leading CapSense® capacitive touch-sensing functionality into a single device. This combination of technology delivers unmatched system value for Bluetooth Smart products, with prolonged battery life, customizable sensing capabilities, and sleek, intuitive user interfaces. The solution also has an on-chip balun that simplifies antenna design while reducing board size and system cost. Cypress (NASDAQ: CY) delivers high-performance, high-quality solutions at the heart of today's most advanced embedded systems, from automotive, industrial and networking platforms to highly interactive consumer and mobile devices. With a broad, differentiated product portfolio that includes NOR flash memories, F-RAM™ and SRAM, Traveo™ microcontrollers, the industry's only PSoC programmable system-on-chip solutions, analog and PMIC Power Management ICs, CapSense capacitive touch-sensing controllers, and Bluetooth Low-Energy and USB connectivity solutions, Cypress is committed to providing its customers worldwide with consistent innovation, best-in-class support and exceptional system value. To learn more, go to www.cypress.com. Cypress, the Cypress logo, PSoC, CapSense and TrueTouch are registered trademarks and PRoC, EZ-BLE, PSoC Creator, F-RAM and Traveo are trademarks of Cypress Semiconductor Corp. All other trademarks are property of their owners. Pictured is the PSoC 4 BLE Pioneer Kit, an easy-to-use development board for Cypress' Bluetooth Low Energy solutions.